A week after Raster and I moved from 829 Beacon Street (near Kenmore Square) to 33 Wilson Park (near Boston College) Raster went missing, probably because he got out of the house before he'd had a period of familiarization and orientation. He was never seen again. Copernicus acquired me while I was visiting the pound with my girlfriend of that time. (That relationship is the topic of my story My Adventures in Boston.) She wanted to adopt a kitten. I wasn't looking to get another. We walked through the maze of cages, peering at a multitude of cats and kittens. Long-haired, short-haired. 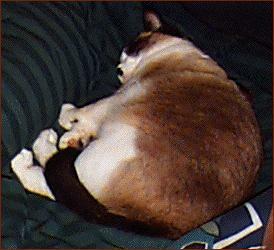 White, black, brown, solid, mottled, young, old, calm, frenetic, asleep, alert and oriented. She decided on an orange kitten she named Pumpkin. 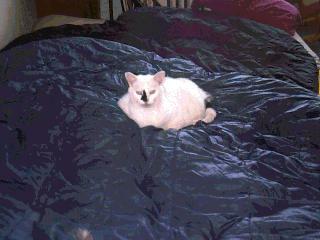 My heart went out the the runt of another litter, a very tiny white kitten with a few black splotches. His mother had died before he was properly weaned. In his entirety he fit into one hand. I couldn't put him down. Pumkin and Copernicus came home with us. Before we broke up my ex-girlfriend decided that she couldn't shoulder the responsibility for raising a cat, and so Pumpkin (renamed Ptolemy to fit in with the dead astronomers theme) moved across the Wilson Park cul-de-sac from her house (No. 11) to mine (No. 33).They played in and out; the front door was rarely closed or locked, and the cats ran the three floors from our flat to the trees outside. One Sunday evening I returned to Boston after a weekend away only to find a note from my roomates telling me that Ptolemy was at the local animal hospital. They'd come home to find Ptolemy poised strangely under the kitchen table, not a typical resting place for him. Upon closer examination they'd noticed that most of his insides were outside, so they bundled him up in a bath towel of mine and rushed him to the vet. He underwent an hours-long operation, worked on by four surgeons. (We suspect that Ptolemy found a skunk or racoon as was cut from stem to stern when his curiosity caused him to investigate.) When I arrived at the hospital he was already in a recovery cage with an intravenous drip, shaved on his belley and on one side, rather unresponsive to human attention. According to the girl attending to the animals, he perked up when I arrived and continued to do better once I'd visited. I visited him every day after the work commute, until I was able to take him home to Copernicus. In 1986, when I moved to California, Cappy and Ptolemy stayed with Ed Greenberg for a few months until I'd gotten settled. Then he delivered them to Flying Tigers airline (ironic name, eh?) and I picked them up at San Francisco International Airport. I'd rented a room in a luxurious house (with pool and jacuzzi) in Redwood City, and the cats used the open window to come and go as they pleased. Late one evening I couldn't find Cappy and so I wandered the neighborhood. I heard a faint meow which I tracked to an extraordinarily tall tree. Yep, he was up and I couldn't coax him down. So I took the chance that a neighbor wouldn't shoot me and climbed up on a roof, into the tree's branches, got my cat, and returned to the ground unscathed. He never did that again. We moved to San Francisco about nine months later, into the Haight-Ashbury neighborhood of flower children fame, to a top-floor flat in a Victorian on Waller Street. Ptolemy died on his tenth birthday. 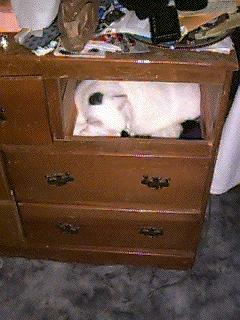 I'll always remember him for his ability to discover small hiding places; favored was an open drawer. 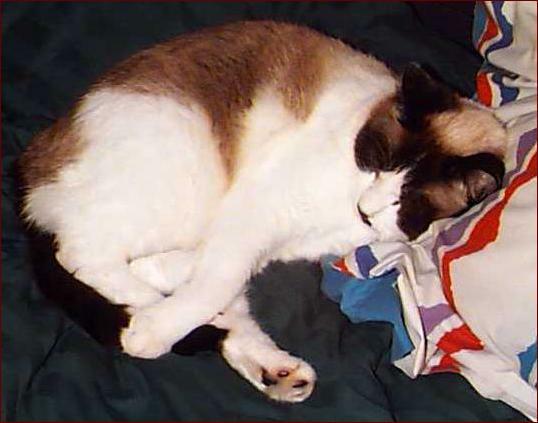 Copernicus and I moved into the Castro neighborhood in 1996, to a house on Eighteenth Street. We had a south-facing garden complete with butterflies for him to chase. My sister and her boyfriend, living below us, had two cats, Miles (Davis) and (Charles) Parker. The upstairs neighbors had one. My roomates had four or five. We rarely closed our back doors and the cats made a communal affair of it all. 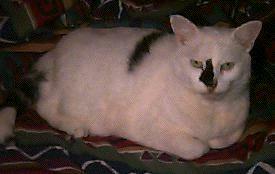 Copernicus, gone a few months before his fifteenth birthday, loved having his lower back scratched to the very end. He was with me for almost half of my life, almost all my adult years. It's very strange not having him follow me around, mewing loudly. I miss you all, my cats who have passed. Thanks for the companionship. You've been a comfort when I needed it and comedy all of the time.